Lets sail cool boats — the new Melges 14! Video Download PDF Brochure Download PDF Pricing Buy a boat! Everyone can sail the Melges 14. By simply interchanging the carbon mast tip, you can modify the Melges 14 to best fit you — easy and really fun for all. This sail is ideal for Melges sailors with weight ranging from 75-120 lbs. It’s a great way to get light sailors in the Melges 14 — 58 square feet of fun. 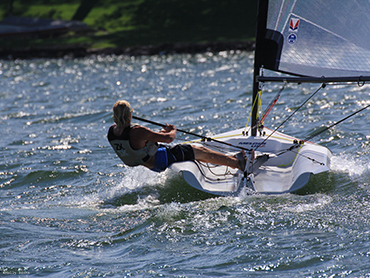 The Melges Blue sail size is perfect for sailors in the 125-175 lbs. range.